The Boxer’s ancestry comes from Germany. They were originally bred between a German Bullenbeisser (a breed descended from Mastiffs) and the Bulldog; however, another breed of unknown origin was also put in the mix. They were used for everything from hunting to pit fighting to cart pulling. The breed became known in other parts of Europe in the late 1890’s and was imported to the United States in 1903. Boxers were enlisted in the military when World War I broke out, serving as messenger dogs and in whatever capacity was needed. The breed became popular in the U.S. after World War II when returning soldiers brought them home. They have been popular here ever since. While Boxers are indeed strong, agile, and somewhat protective of their owners, they also have a jolly, fun-loving personality. Because of their playful nature and boundless energy, they are sometimes called the “Peter Pan” dog; they aren’t fully mature for about three years and stay in the puppy stage far longer than most breeds. The typical Boxer is high-spirited, alert, friendly, and loyal. Boxers are not “outdoor dogs.” Their short hair and short noses make them uncomfortable in cold and hot weather. They are high-energy dogs and need a lot of exercise. Boxers make a wonderful family pet because of their great love of and devotion to their family. Boxers usually weigh between 55 to 70 pounds and stand approximately 21 to 25 inches tall. They have a graceful, athletic-looking body with well-defined muscles. Their coat is extremely short and comes in various shades of brindle and in a variety of color combinations including red and white. Boxers are known to drool A LOT! 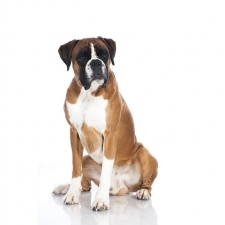 Boxers are the 18th most popular breed of dog registered with America's Pet Registry Inc. Famous celebrities who have owned boxers are Sylvester Stallone, Justin Timberlake, Luke Perry, Humphrey Bogart, Alec Baldwin, Jodie Foster, George Clooney, and Robin Williams.